A high-performance microphone tuned to capture low-end punch. Tailored frequency response is smooth and extended. Tuned specifically for kick drum applications. Includes 15ft. (4.57m) cable and storage bag. 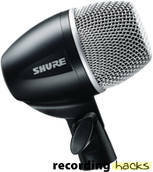 The PG52 is included in the Performance GearPGDMK4 and thePGDMK6Drum mic kits.